North Carolina’s legislative leaders will not be in Raleigh for too long during this year’s short session. Over the past few weeks, behind closed doors, legislative leaders in the House and Senate have been putting together their budget and plan to move it through this week through a process that will allow for no input from the public or amendments from members. Legislative leaders plan to introduce their final bill as a conference report skipping the committee approval processes and prohibiting amendments. Legislators haven’t completely skipped the amendment process since at least the early 1970s. As a result, the two chambers will hold up-or-down votes in the coming days on what is called a “conference report”, with no ability for changes or to vote for some of the $23 billion budget plan. As a critical document that can support our priorities and the values that we share, a budget crafted in a secretive and undemocratic process won’t ensure that leaders hear all the views and needs of North Carolinians. Traditionally, lawmakers come back for a short session a year after passing a two-year budget to adjust the second year’s spending. Traditionally, lawmakers review agency needs, emerging opportunities and challenges for communities and discuss policy issues that are connected to appropriations. Instead, legislators are on track to ignore much of what people have asked for since the last budget was passed. Investments in every child’s educational success, protection of air and water, support to ensure the health and well-being of families and older North Carolinians, and the affordability of higher education, for example. Legislators seem poised to ignore budget recommendations from the governor that were pointing North Carolina in the right direction, such as stopping the scheduled tax cuts in 2019 and making progress in many areas that have been neglected over the years. These areas included paying our teachers and principals adequately; investing in mental health, air and water clean-up and monitoring, improving prison facility security, increasing low-income housing, and promoting new workforce training and programs that lead to industry credentials in high-demand fields. As the state budget process is still unfolding legislators have an opportunity do the right thing by promoting transparency, encouraging debate, and stopping the harmful tax cuts that are scheduled to go into effect in 2019. Advocating for these principles demonstrates a real commitment to the people, our democracy, and true accountability in the budget process. 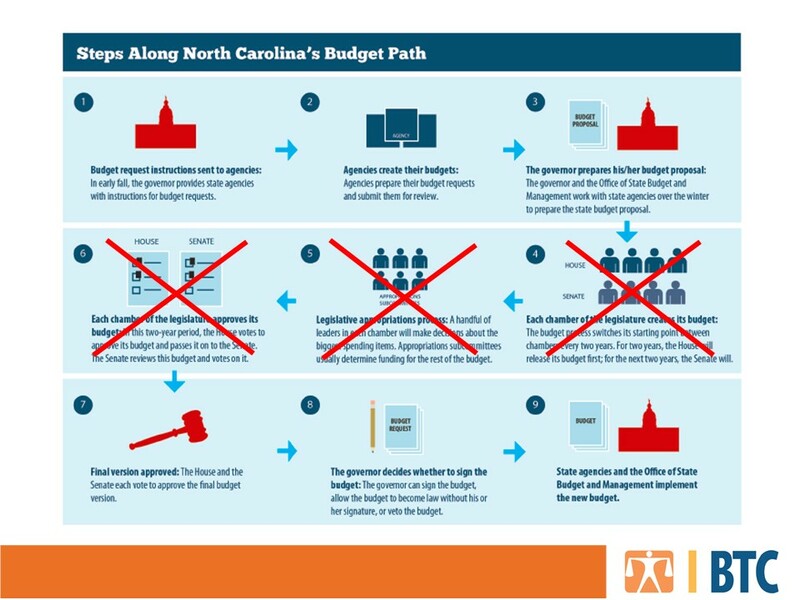 Rushing the budget process is not what North Carolinians need or expect from their legislators.